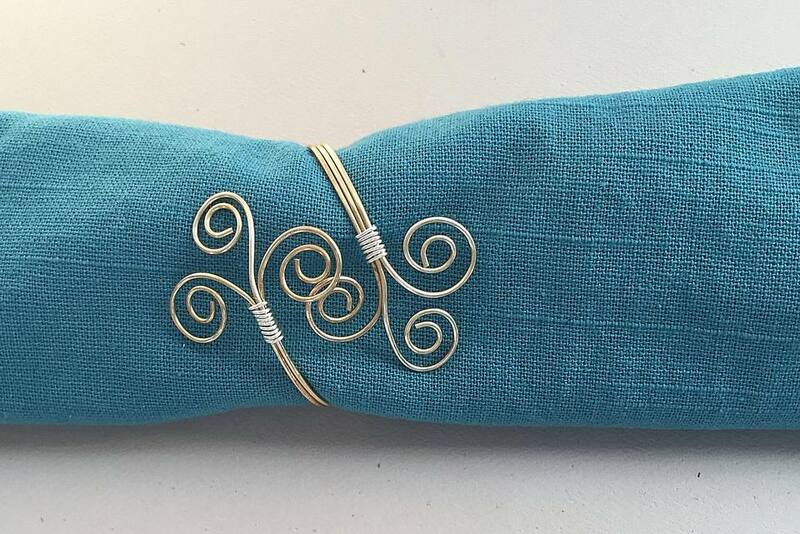 Holidays are the perfect time to make these twisted wire napkin rings to dress up your table or give as a hostess gift. But don't limit yourself to special occasions. This pretty wire project can dress up your table any day of the year. This project is especially good for gift giving because...gasp...not everyone wears jewelry! 3 pieces 18g wire each about 9-10 inches long. 9-12 inches of thinner wire (22g) to hold the wires together. This is optional since you can twist the middle 4.5 inches of the 3 wires together instead of wrapping them. There is a slide that shows the twisted napkin ring variation at the end. You will need basic wire wrapping tools such as round nose pliers (or bail making pliers) to make the spirals and chain nose or bent nose pliers to secure the wrapping wire. In addition, we used blue painter's tape to temporarily hold the wires together. This kind of tape is good because it will not transfer glue to the wire and removes easily. Cut a 5-inch piece of the binding wire, fold the end over and wrap it around the three main wires near the center. Grasp the wire end firmly and wrap the thinner wire until you have a small coil forming. Make sure the main wires stay close together. They don't need the group of wires to stay flat - that is really up to your taste and how you would like them to look. When you are finished wrapping the wires together, trim the end of the wrap wire (silver wire in photo) and tuck in the back. Make sure there are no sharp ends to get caught on the napkins. At this point, the wire wrap is probably just loose enough to slide around a little. Push the coils together and move it to the center of the wires. When you are satisfied with the placement, use your chain nose pliers to press the wire wrap flat securing it in place. Shape the napkin ring around any round or oval object of the right size, about 1 inches in diameter. We used a plastic container that we store beads in. Depending on the type of wire you use and it's temper, it may spring out slightly. We wrapped the wire around a container 1 inch in diameter to get a napkin ring with a finished size of 1.5 inches in diameter. At this point, we added a couple of more wire coils about 2.5 inches from the end of each wire - to hold the wire in place and also for decorative effect. This is optional. To add the wrap, cut the remaining 22g wire into two equal length pieces and coil wrap around the main wires. Slide the coils into place and press firmly with your chain nose pliers to keep them in place. Separate the three wire ends on each side of the ring. This will help give you some room to make the wire spirals. Grasp the end of the wire with your round nose pliers. We are using bail making pliers, which have a single size round barrel the entire length of each side of the plier. Bail making pliers are handy to make consistent sized loops or coils that can be used to make jump rings. This earring project has a good description of the differences between bail making pliers and step pliers. This is optional, but we find it is easiest to start the spiral on each piece of wire. We do this for two reasons. One, it makes it easy for me to remember the pattern but most importantly, we won't get scratched or poked by the other wire ends. We have started the wire spirals going turning towards the outside on each of the outer wires. Then we will just choose a direction for the middle wires. Make a spiral on the wire end by grasping the loop flat in the chain nose pliers and pushing the wire around the center loop. You can do this gradually for a precise round spiral or use your fingers to make a more casual ​free-form spiral. Continue making wire spirals until each wire is finished with one. Adjust the spirals as needed. Remove the tape holding the wires together by unwrapping it. It should come off without any glue residue. If there is glue remaining, it can be removed with acetone nail polish remover - but try it on a piece of scrap wire first to make sure it won't discolor your wire! Shape your napkin rings and adjust the size by wrapping them around some napkins or the mandrel. When finished, our napkin rings are slightly more oval than round. Add napkins and enjoy! This picture shows the front of each napkin ring and the different look you can achieve when you make the spirals very precise or more organic. This is a very basic design that can be easily changed to suit your mood and supplies.